Today, the athletes finally arrived! I had the pleasure of meeting a really interesting woman named Cathy who was working on the same team as me. 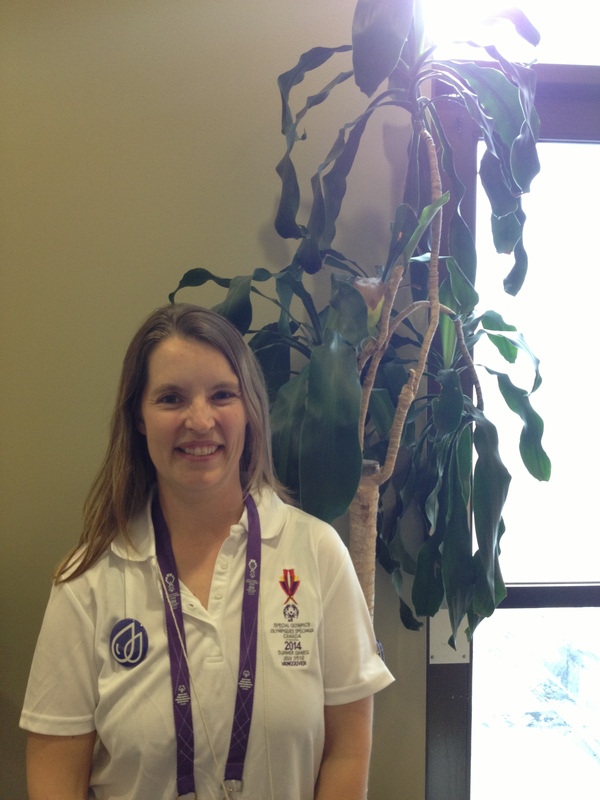 She’s currently pursuing her PhD in kinesiology at UBC, although much of what she focuses on is in sport sociology. Specifically, she researches the lives of figure skaters and the tensions they face in balancing competitive sport work ethics with leading “normal” lives. She used to be a competitive figure skater herself. (In fact, when I took the photo of her, her feet were in a T-formation out of habit from figure skating poses). Then, at the young age of 16, she began coaching figure skating and continued to do so until she was 30. While coaching, she often felt conflicted by her duty to make or encourage bold decisions on behalf of the athletes. For example, she told me about a time when a young girl she coached was going to leave on a family vacation to Florida. Cathy, doing her job as the coach, advised her that to maintain her competitive edge, she should stay behind and practice. The girl listened and even felt like it was the right decision. But she had to miss out on meeting Mickey Mouse. Does the trade off always have to be so extreme? Is it possible to lead a life as a competitive figure skater and meet Mickey Mouse? Cathy is interested in reforming the way we view competitive sports systemically — from the intense and seemingly unbalanced lifestyles competitive athletes experience, to the sociological interpretations of femininity and masculinity within the sport. But she is unsure about what would be the best way to ignite change. Is it from the bottom-up? Top-down? What career should she pursue to make the most effective and sustained change as possible? A friend of hers told her that if she’s going to make a difference, she has to find a research topic that makes her jump out of bed every morning. With this kind of attitude and commitment to process over result, she says there would be no need for grades or medals to provide incentive for achievement. I found that to be quite fascinating. This is the research topic she chose. And she needs some help. Please, please, please send her an e-mail (cathy.mills@alumni.ubc.ca) if you or anyone you know fits the bill! I think the work she’s doing is really valuable and inspiring. I’m excited to be working alongside her over the next week at the Games.